Hi friends, let me let you in on an incredible news, it’s DINNGO - The Digital Currency Exchange!!! The buzz about cryptocurrency is increasing, people have heard about it, and more and more people want to find more about it, and find a way to be a part of it. When blockchain technology came, so many things changed, for better, we say. So many businesses have improved, so many companies have started using crypto currencies in their work. The new ideas are coming every day. People want to invest in the new projects. We have the biggest tool in the world, and it is called the Internet. The internet is a enormous base of information where we can do anything. Internet has connected the entire world. One of these projects is, DINNGO, who is revolutionizing the way we trade digital currencies. The cold wallet of DINNGO integrates seamlessly with the DINNGO exchange, providing the secure, fast and convenient asset trading service the market needs. DINNGO was established in 2015 in the San Francisco Bay area, used to be a mobile payment platform focusing on college students’ daily expenditures. DINNGO was a payment app that turned the simple act of tagging into payments. By uploading a photo and tagging friends in-app, expenses and bills are then split amongst those tagged, allowing group activities to stay fun, minus the pain of figuring out shared costs. With the experience in the mobile payment industry and the integration of financial systems, DINNGO is familiar with traditional banking systems and regulators, especially the struggles with the old and centralized banking structure. Hence, DINNGO transforms into a digital currency platform, aiming at handling digital asset smartly and transparently leveraging blockchain technology. With the background of mobile payment practice, and the new team members with blockchain expertise, DINNGO is fully prepared to be the digital currency exchange of the era. DINNGO is the first exchange to enable simple two-step verification with the mobile device and cold wallet. DINNGO is a hybrid digital currency exchange that utilizes a decentralized approach to enable users the ability to hold their assets individually. Decentralization is the essence behind blockchain technology. Blockchain is a decentralized, distributed and public digital ledger used to record transactions across many computers so that the record cannot be altered retroactively without the alteration of all subsequent blocks and the collusion of the network. Cold wallets, additionally referred to as hardware wallets, are small gadgets that every so often hook up with the internet to execute transactions. They are distinctly secure because they typically perform offline. As a end result, they're now not hackable. However, these offline devices presently require a variety of more steps to connect to an exchange. Among the repeated hacking episodes that have destroyed both centralized and decentralized exchanges, the DINNGO hybrid exchange introduces a measure that will change the state of crypto-trading for the better. Trading digital cryptocurrency is always a risk, as traders spend countless hours connecting autonomous wallets to make sure their wallet is safe and free from hackers. This proves once again that decentralized exchanges are in no way useful or effective. The new solution will allow users to safely trade cryptocurrencies on their exchanges without fear of hacking. Developers have tried hard to create their platform, providing its customers with the latest system of cryptocurrency exchange and a range of innovative tools. Customers will be able to trade cryptocurrency comfortably and safely. The main factor of the platform is safety. DINNGO offers its own tools for protecting users. Currency can be stored in online wallets or in special mobile applications. The exchange will use a decentralized approach and allow users to save their assets separately. The cold wallet is fully integrated into the system and can be efficiently used for transactions both on a PC and from a mobile device. The system supports all popular types of wallets: MetaMask, Trezor and Ledger. Features DINNGO -Integrated interface, you can freely design your own interface according to your desire. 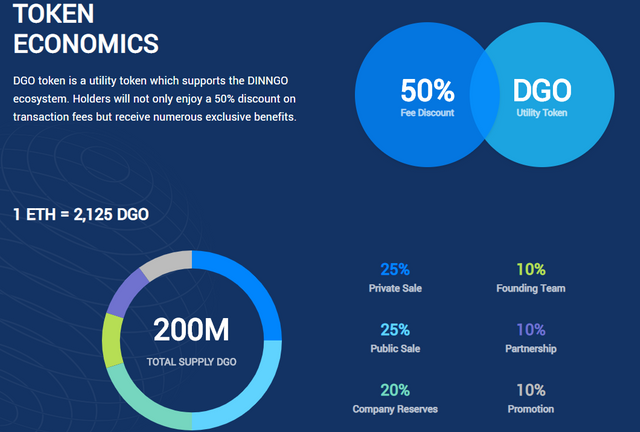 DINNGO provides its customers with the protection of their cryptocurrency funds using smart contracts and blockchain technology, as well as centralized trading methods. DINNGO will go down in history as the first exchange that offers Bluetooth integration between mobile devices and stand-alone wallets. The company cooperates with manufacturers of the best cold wallets. All off-the-shelf tools are fully integrated with the ecosystem's mobile terminals. The key to the revolutionary change was the internal token of the system. To complete transactions, it will be possible to use both a mobile and a fixed version of the interface. Confirmation of transactions is carried out through a mobile application. Freely design your very own interface at your need. No greater single point of failure,the essence of decentralization. No unnecessary rate wastes on-chain. Your own asset is below your personal manipulate. Compliance is the floor of the platform for lengthy-term carrier. Dedicated supporting group is usually ready.